Postcards from the Attic: I'm still alive! Oh dear I seem to have been so busy lately, I've been neglecting old bloggie. I've not had much to share as I've mostly been spending my time creating my Banana Frog samples for my guest spot and of course I can't show those until it's time for them to go live. So instead here's a layout I've done for the UK Scrappers challenge this week which was set by my team this time. I'm really not keen on it at all if I am honest as I don't like the colours (challenge was to use a holiday photo and the colours of the country) but there are a couple of cool things on it. Firstly I flattened out and die cut a Coke can to make the embellishments (be careful, it's very sharp! ), and also my journaling 'lines' are a little border stamp. My Gingersnaps debut is 1st April so after that I should get my bottom in gear to update more often! Love that Coca-Cola star! Great layout! 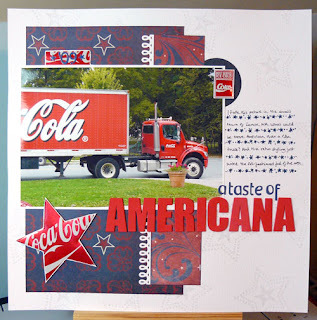 I really like this - love the colours and all the little twiddly bits - wish I was going to USA this year!